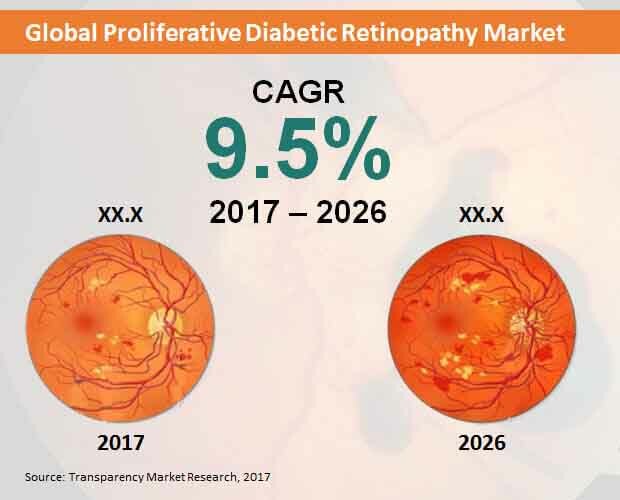 The demand within the global market for proliferative diabetic retinopathy has been rising on account of the growing incidence of diabetes across the globe, finds Transparency Market Research (TMR). The leading vendors in the global market for proliferative diabetic retinopathy have made concerted efforts to earn sustainable revenues through the sale of their drugs. These vendors have focused on building a permanent consumer base in order to ensure a base revenue index throughout the year. It is expected that the nascent rise in the number of distributors of diabetic drugs would have a positive influence on the growth of the market vendors. The global market for proliferative diabetic retinopathy displays a moderately competitive business landscape. This is because the leading vendors in the global proliferative diabetic retinopathy do not have any substantial competition from the smaller vendors. Furthermore, the small and medium-sized vendors are not in a position to challenge the monopoly of the leading vendors. For this reason, the medium-sized players have restricted themselves to regional and local markets for proliferative diabetic retinopathy. It is expected that strategic partnerships, acquisitions, and alliances would be salient features of the global proliferative diabetic retinopathy market in the forthcoming years. A report by Transparency Market Research (TMR) prognosticates that the global market for proliferative diabetic retinopathy would expand at a respectable CAGR of 9.5% over the period between 2017 and 2026. Furthermore, the global proliferative diabetic retinopathy market is projected to reach a value of US$ 1,000 Mn by the end of 2026. On the basis of distribution channel, the sale of proliferative diabetic retinopathy drugs is majorly accomplished via hospital pharmacies. Based on geography, the market for proliferative diabetic retinopathy in Asia Pacific is expanding at an astral rate. The sedentary lifestyles of the masses, lack of strenuous activities, and unhealthy eating habits are some of the key factors that have led to the rising incidence of proliferative diabetic retinopathy in recent times. People diagnosed with diabetes, in extreme cases, are also at a risk of suffering from proliferative diabetic retinopathy. For this reason, the demand within the global market for proliferative diabetic retinopathy has been escalating at a stellar rate in recent times. The government has also emphasized on the need to prevent proliferative diabetic retinopathy to assure a high quality of life for diabetics. This factor shall lead to the inflow of huge-scale revenues into the global proliferative diabetic retinopathy market over the coming years. The demand within the global market for proliferative diabetic retinopathy could be restrained by a tight system of checks preceded by the distribution of drugs. However, the presence of a large number of vendors in the global proliferative diabetic retinopathy shall make up for the hindrances to market growth. It is also expected that the global proliferative diabetic retinopathy market would expand due to the popularity of oral drugs. Corticosteroids are extensively used for the treatment of proliferative diabetic retinopathy, and this factor shall also aid market growth in the years to come. The review is based on TMR’s report titled “Proliferative Diabetic Retinopathy Market (Drug Class - Anti-VEGF Agents, and Corticosteroids; Mode of Administration - Injectables, Oral, and Others; Distribution Channel - Hospital Pharmacies, Retail Pharmacies, and Online Pharmacies) - Global Industry Analysis, Size, Share, Growth, Trends, and Forecast 2017 – 2026”.